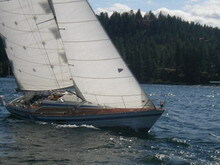 1980 37' O'Day Center Cockpit Sailboat for sale. 32 Horsepower Diesel Atomic Engine. Has a lot of storage. Was loved for many years. However, it had fallen into disrepair. We have cleaned it and worked on many cosmetic issues. 2 heads-fore and aft cabins. Refrigerator, 2 sinks, plentiful cabinets, microwave, oven. The engine is in good condition. There is a membership for sale as well at Panhandle Yacht Club on Lake Coeur d'Alene. The cost for the membership is $16,000. The Panhandle Yacht Club marina consists of 112 sailboat slips. The grounds include showers, two barbecue decks, pump out, mast crane, dinghy storage, paved parking, swim dock, and harbor master residence. Located about 10 miles south on hwy 97 from the I 90 wolf lodge-harrison exit, east of Coeur d' Alene, turn right 1 mile past the Hutton Store(Eat @ Eddies sign) Google Maps: Panhandle Yacht Club. There is a lease available for the slip if you would prefer not to purchase at this time. This is a 41' 4", Elvstrom/Kjaerulff designed, Danish built sailboat that is fast, fun and built with old world craftsmanship. I am the second owner - this boat has been cared for her entire life. She is hull #5 in a run of about 22 boats. Has a yanmar diesel with folding prop, rod rigging, hydraulic boom vang, back stay tensioner and running back stay tensioners, Raymarine ST60 instrument package in cabin and on deck, and is easy to sail with a self-tacking jib. Has had the bottom completely re-done and new treadmaster decking installed and comes with an extensive equipment list which includes a full winter cover. Mooring is available separately at Panhandle Yacht Club. Membership A 19 available for lease. Membership D 100 available for sale or lease. Lease = member dues +associate dues + electricity. D dock boats face west (bow to wind), no opposing boats, and scenic west view. 2017 Membership dues are included in price. Membership includes: Sailboat Slip A 10, Use of all the Yacht Club facilities, Boat Haul Out, Mast Cane, Dinghy Dock, Dinghy Storage Rack, Two Barbecue Decks, Two Large Barbecues, Free Ice, Microwave ovens, Free Showers, Free Parking, Library, Swim Beach, Camping Sites, Full time Harbormaster for more Security. Membership includes: Sailboat Slip B-38 12 wide, Use of all the Yacht Club facilities (free showers, parking, club dock, camping sites), Two Barbecue Decks with awesome views overlooking the lake, pump out facility, boat haul out, mast crane, dinghy storage, paved parking, swim dock, and fulltime harbor master residence ensuring security. PYC is a very nicely maintained club with friendly people who like to sail and get together for social club activities. Membership B-37 is offered for sale or lease. This 12-foot slip is located on the outside of A-Dock where docking is especially easy and boats are moored bow to the wind. For further information, contact Richard Dozier. If you are a Member or Associate Member of the Panhandle Yacht Club and would like to place a classified on this web page, please send all information and pictures of the item(s) you would like listed to pycinfo@panhandleyachtclub.org. The classified must be sailing related and will be placed on this website at the discretion of the PYC Corresponding Secretary.